The first quarter might have been the most one sided contest in NFL history. Carolina absolutely dominated, especially Cam Newton, jumping out to a 14-0 lead. Newton went 8/9 passing for 80 yards and a touchdown to Ed Dickson. Cam also added 46 yards on the ground. Carolina had 19 offensive plays compared to the Saints two, and put up 169 yards to just seven for the Saints. Jonathan Stewart capped off the 1st quarter with a 2-yard TD run as time expired. As dominate as the first quarter for Carolina was, it was the Saints who would lead at half 17-14. New Orleans took advantage of two Carolina turnovers. First it was a Newton interception, which he made a touchdown saving tackle at the 1 yard line on. However, one play later Mark Ingram crossed the goal line. The second was on a fumble by rookie Christian McCaffrey, which led to a second Mark Ingram touchdown. New Orleans came out hot to start the second half, quickly going 77 yards on 9 plays and scoring to take a 10 point lead, 24-14. Drew Brees was 6-6 on the drive, including a 16 yard touchdown pass to Ted Ginn Jr.
After trading punts, the Panthers desperately needed to get something going offensively. Newton executed a perfect play action pass, connecting with Devin Funchess for 52 yards down the field. Three plays later, he hit McCaffrey with a little screen pass, and after breaking a few tackles, scampered 23 yards to the end zone. This cut the Saints lead to 3, 24-21. 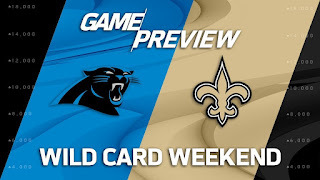 Carolina forced another New Orleans punt, and Newton drove the team right down the field in 7 plays, giving the Panthers the lead on a two yard touchdown pass to Brenton Bersin. This gave Carolina the lead once again 28-24 with just under 8 minutes to play. Going with the no huddle, Brees marched the Saints offense right down the field in 7 plays, which was capped off by a third Mark Ingram touchdown - this time from a yard out. Brees was 4-4 on the drive for 55 yards, including back to back first down passes to Alvin Kamara. Saints back in front 31-28 with 4:48 to play. Newton throws an interception, but gets bailed out by a roughing the passer call, giving Carolina new life. After the huge 15 yard penalty, the Panthers were able to tie the game at 31, thanks to a 20 yard Graham Gano field goal. The Saints take over with 1:34. Starting at their own 25, Brees starts the drive with a 24 yard completion to Michael Thomas, immediately moving the Saints to midfield. Brees then dumped off two straight passes to Kamara to move the Saints to the Panthers 36. Ingram then picked up 27 yards on back to back big runs, taking the Saints inside the 10. New Orleans was flagged for holding on the next play, moving them back to the 20. After Carolina stuffed Ingram on the next two plays, Will Lutz attempted a game winning 39 yarder, which he drilled with 2 seconds left.